I love old looking barns, in fact there's one on the lot behind my house, one of the reasons I picked our lot when we built our house. The barn image from the Artistic Outpost Home Plate looks like it would be a beautiful place to visit, and it's perfect for the Sanded Whitewash Technique in the August TJNL. When cutting the Barn image, I did cut my greeting away from the image, so that I could position it in other places on my panel without having to ink the whole image. 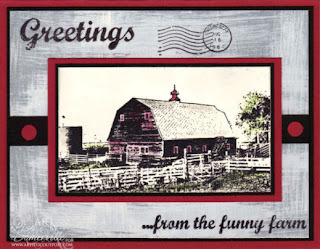 The Barn image is stamped on White card stock, then colored with markers. I used a SAMJ to stamp the sentiments and postmark on the Sanded Whitewash background. Don't forget to use code LS-15off to save 15% on all your Artistic Outpost purchases. Very pretty, I too love vintage, nostalgic scenes. Not too many barns to look at in El Segundo, nor do we have a fall, but I still love that season. Great technique on the background paper. LOL! I also love barns...but that saying is perfect for this house too! LOL!